After writing poetry for 40 years, Tony Crawford, retired curator of manuscripts in the Morse Department of Special Collections of Hale Library, has published a book, "Life Shards: Poems." Manhattan Public Library will host Crawford for a reading in the auditorium at 6:30 p.m. Thursday, July 21. The event, co-sponsored by Kansas State University Libraries, will include light refreshments. Crawford's paperback volume, printed by Ag Press in Manhattan, contains 143 poems on a variety of themes; copies will be available for purchase at the reading. "Life Shards" also is on sale at Claflin Books and Copies at 103 N. Fourth St.
Crawford retired in January 2015 after 31 years at Kansas State University Libraries. 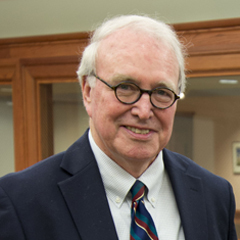 He was hired by President Duane C. Acker and former Dean of Libraries Brice Hobrock in 1983 as the first professional archivist in the university's special collections department. Crawford was the co-author of "Generations of Success: A Photographic History of Kansas State University, 1863-2013." He also wrote shorter pieces on the history of Manhattan, the campus and its students that the Libraries published in a collection titled "K-State Keepsakes," available online at newprairiepress.org/ebooks/3.